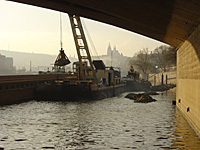 The activity of the company is focused on the performance of water works on the navigable section of the water course of the Elbe river and the Vltava river and on ensuring carriage and liquidation of excavation materials arising from building activities located in the surroundings of the water route. Within the frame of its activities, the company uses especially the capacity of the company České přístavy, j.s.c., as are vessels, floating cranes and dredges. In addition, the company co-operates with companies, which own special techniques for under-water parts of river-channel, as are underwater dozers Komatsu. 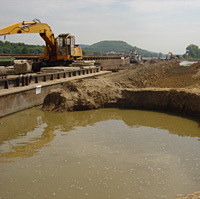 Since year 2002, the company made series of so called flood dredging from the acceptance of the orders to their handing over to the principal on the Vltava river as well as on the Elbe river. The company also participated in important building activities in Prague, building of the business centre Palladium in Prague 1 and building of the business-residential complex Prague Marina in Holešovice.